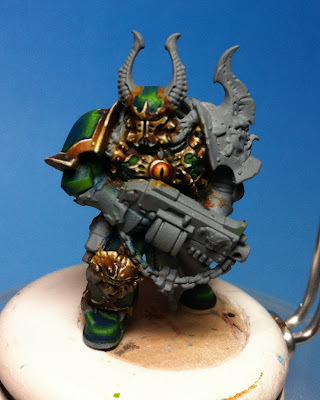 Just a quick post for a monday morning… this is the Chaos Space Marine I’ve been working on. I’ve done some more of the NMM gold and painted the gem in his chest in an ‘Eye of Sauron’ stylee. These are very quick photos with my phone, so the quality is not the greatest (it is definitely smoother IRL), but I think the NMM is really beginning to pop. 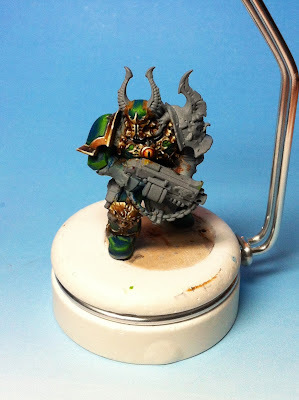 I think with the NMM style that Tommie taught us last weekend, the real battle is learning where best to position the light blooms and not being afraid to change them if it doesn’t work. I am always amazed when people can paint section by section, and get the same colors to work so nicely! Great work so far, and loving the style your taking on this. Thank you. 🙂 Its not actually been a problem matching the colours one section at a time, but you get the added advantage of really being able to dedicate your attention to the specific areas. I use a Wet palette which can help with getting the colours the same, but I have replaced the paper a couple of times so started fresh each time.Its been fun so far!